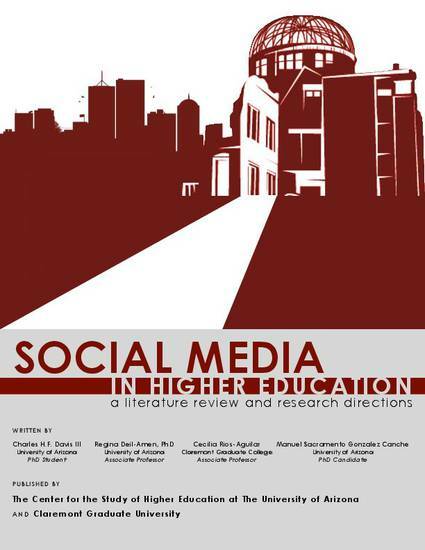 Social Media in Higher Education: A literature review and research directions. Social media [technology] has become a growing phenomenon with many and varied definitions in public and academic use. For our purposes, the term social media technology (SMT) refers to web-based and mobile applications that allow individuals and organizations to create, engage, and share new user-generated or existing content, in digital environments through multi-way communication. Despite the widespread use of SMT, little is known about the benefits of its use in postsecondary contexts and for specific purposes (e.g., marketing, recruitment, learning, and/or student engagement). It is critical to begin to examine if and how higher education institutions are incorporating the use of SMT. This review of existing literature on the use of SMT in higher education will provide a baseline sense of current uses nationally, providing a descriptive overview of the phenomenon. This research was supported by funding from the Bill & Melinda Gates Foundation. Davis III, C.H.F., Deil-Amen, R., Rios-Aguilar, C., & González Canché, M.S. Social media and higher education: A literature review and research directions. Report printed by the University of Arizona and Claremont Graduate University.